EdTechLens is a fabulous multi-media online science learning program. Rainforest Journey is currently the only module available, but it is my understanding that more modules are being developed. This highly interactive science curriculum is a fabulous addition to enrich any elementary science program. It is also a complete study all based around the rainforest. This media rich experience takes the student on a journey of a lifetime. It covers several aspects of the rainforest all within the comfort of your own home. You don't even need to get out of your pajamas! The curriculum can also be enjoyed by an entire classroom of students. I can only imagine hearing the ooh's and aah's as the pictures are displayed on a large screen. For sure there were several moments of awe in my son's rainforest adventure as he really enjoyed the crystal clear pictures. He would often call for me to come and look at what he was learning about. Each student receives their own log in information. Each day they log in to their account and continue their lesson. I had my son work for 15 minutes each day while logged in. He would complete the assigned reading each day and take assessments as he came to them. Typically there was an assessment at the end of each unit as well as a hands-on activity to complete. As a teacher, you can log in and view your student's progress. You can also allow access to different areas of the site. This is nice because you can turn on or off the assessments that you do or don't want the student to use. Both my son and I have been most impressed with the photographs. There are some impressive images in this program! They are all very clear and eye-catching. You can click on the picture and enlarge it so that it fills most of the screen. Vocabulary words are highlighted in a green font and if you roll your mouse over them, the definition pops up in a little box right over the word. This program truly draws the child in and brings the rainforest to them! I never heard one complaint about doing science school, not once. He has always enjoyed this study. I'm waiting to see what else EdTechLens will roll out. Another accommodation that this online interactive program makes is that the text can be read out loud to the student while the student follows along or simply listens. There are two levels of information in each part of the lesson: the regular portion of the lesson and an enrichment section. My son completed each part of the lessons including the enrichment portions. We found that the enrichment parts expanded on the main lesson and really enhanced the program. I appreciate that the lesson includes a recorded option for the students to listen to. Lessons can be viewed on the computer or on an iPad or other handheld device so you can take your lesson on the go. Options are given for downloading the lesson and printing or viewing the PDF on your device as well. Rainforest Journey also includes a trip journal written by a family who took a trip into a rainforest. 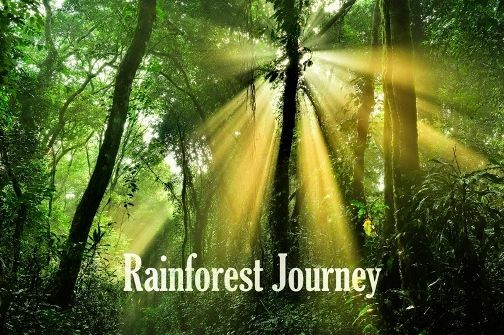 This is a wonderful addition as you can read what a real trip into the rainforest would be like. This is just one more aspect that helps to engage the student and bring the learning to them. Would you like to read what other reviewers had to say about EdTechLens? Check out the Review Crew Blog for more!